A fellow angler kindly offered to take this photo. Thank you Jack! 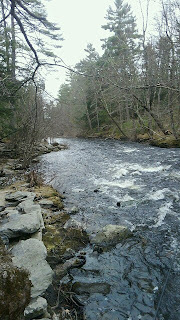 I hit the Squannacook River for a couple hours earlier this evening. Flows are up slightly and the water is cold. Bugs were popping everywhere when I got there despite the overcast skies but there was no surface action. I started off the day nymphing every likely looking area. I really had to work to get the fish to commit but as soon as I figured out the pattern, the fish were really committing. The major producer earlier was a #16 olive partridge soft hackle and a #18 tungsten midge. Later on as I lost a couple of set ups to break offs and trees, I switched over to using a #8 olive wooly bugger. All strikes occurred at the end of the swing after a jigging motion was added. 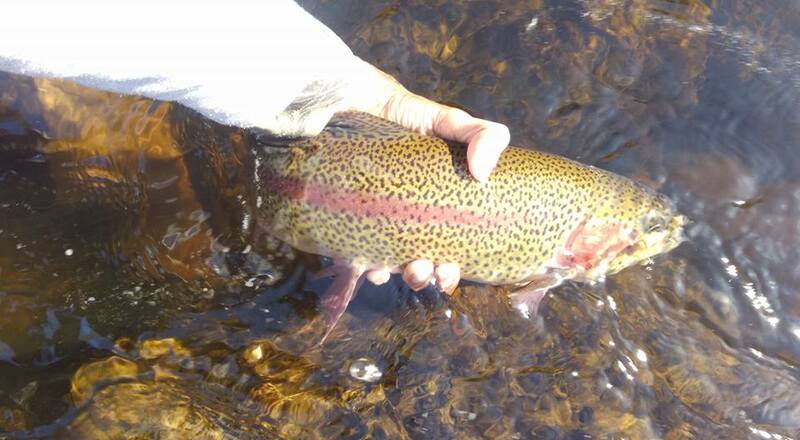 Afterwards, I briefly returned to nymphing and caught and released one final fish before calling it a day. All fish caught today were brookies from 9-12 in. Approximately 2000 such brook trout from 9-13 in. were added to the Squannacook yesterday as well as Thursday. For more information on where to fish that river and what flies to use, visit Evening Sun Fly Shop and talk to Charlie!